This live two-day webinar by Eli Financial will provide expert insights on new tax rates, deduction changes, sunset provisions, and alimony details—as well as issues affecting everything from fringe benefits to estate and gift taxes. Thanks to the Tax Cuts and Jobs Act of 2017, it is important that tax professionals help clients understand the future—the positive and negative effects of the new law—before it’s too late to implement a smart planning strategy. 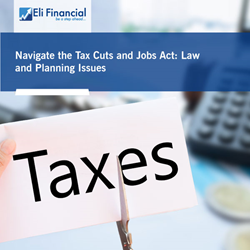 Eli Financial, a division of audio conference and corporate education leader ProEdTech, will host the live two-day webinar, “Navigate the Tax Cuts and Jobs Act: Law and Planning Issues” with industry veteran Arthur Joseph Werner on July 18 and 19, 2018 at 1:00 PM ET (4 hours/day). A tax professional is often caught in a dilemma: The client does not view him/her as a tax planner but as a compliance specialist who prepares tax returns. In other words, a tax professional typically addresses a client’s financial past. Thanks to the Tax Cuts and Jobs Act of 2017, it is important that tax planners help clients understand the future—the positive and negative effects of the new law—before it’s too late to implement a smart planning strategy. In this in-depth webinar, tax expert Arthur Joseph Werner will show tax professionals how to reinvent themselves and the services that they provide to their clients. Werner will review and unravel the complexities of the new legislation, and teach tax planners how to advise a client to adjust to the Act – well prior to tax season. He will provide expert insights on the new tax rates, deduction changes, sunset provisions, and alimony details—as well as issues affecting everything from fringe benefits to estate and gift taxes. This course will cover the various opportunities available to clients in the areas of individual tax planning, business tax planning, estate planning, financial planning, asset protection planning, and retirement planning. At the end of this eight-hour presentation, attendees will feel very comfortable with their ability to give total integrated planning advice to their clients. ProEdTech’s Eli Financial platform offers tax and banking professionals, focusing on providing high-quality online training products customized for U.S. lenders and tax practitioners that include the latest updates from the IRS, CFPB and other regulatory authorities. ProEdTech’s AudioEducator webinars offer updates, regulatory knowledge and information on the latest news in various medical specialties, as well as coding and billing updates, and analysis of regulations that affect ambulatory surgical centers, home health, long term care and hospice facilities, hospitals and healthcare systems, health insurers and physician practices. Webinars are also offered through AudioSolutionz in the technology, human resources, construction and housing, ICT and telecom, manufacturing, consumer packaged goods and retail, safety and security, transportation, energy and environment, education, trade, and chemicals industries. ProEdTech regularly provides professionals the opportunity to get answers to their most complex questions directly from experts, without having to attend costly live conferences. To learn more, visit: http://www.proedtech.com/.